Every person who comes into this world tries to understand himself. He wants to discover his existence and his functions in the world. This requires that a person knows his competencies, character traits, strengths and weaknesses. At the gates of the Academy of Socrates, was written "Know Yourself". And that not without a reason! Because a person who recognises himself and at the end of this effort knows the meaning of his existence, knows what he wants. Such a person is on the best way to improve himself further and further. On the way to self-knowledge and to improve yourself further, it is very important to make peace with yourself first. This takes some time. Such a thing does not go from one day to the next. You have to put off your old burdens, change your habits, fight your fears and part with things that have a negative influence on you. This is a development that can be laborious, but you have to take this time to develop as an individual. For a person to be able to improve and develop, he must work very intensively and disciplined on himself, he must be aware of his environment, he must always take responsibility for decisions, no matter whether they were good or bad, and what is most important, he must not run away from his problems. This means that he must try to make up for his old decisions that caused something bad and caused problems. If that is not possible, then at least he must bear the responsibility for it. Remember, there is a solution for every problem! Life itself means development and change. Every living being in this world develops and changes. Change and development is involuntary the first time, because life often throws us in the cold water with it, but if we open us up and learn to deal with it, then we can take control of it into our own hands. Life is always whispering to you: "Improve yourself!" People who do not develop themselves, can not meet their needs. Life will not allow that! Two men are in the woods cutting down trees. The first man always gets up early in the morning and started working. While one tree was falling, he started with the next tree. He works without a break and sometimes he doesn't even take a lunch break. So he worked long into the night. He even worked a few hours more than the second man. The second man rested from time to time, had his lunch breaks and when it started to get dark he stopped working and went home in time. Both worked at this pace for a week and then began to count who had felled how many trees. The second man had considerably more trees. The first man was angry and asked the second man how that could be? After all, he had been working longer and longer! He had started earlier and stopped later than the second man and worked through without a break. How could it be that the second man still had more trees? He asked the second man about his secret. The second man replied that there was no secret. He continued: "While you were working through the whole time, I was always taking breaks and sharpening my axe. With a sharper axe you can cut down more trees with less effort." Developing means sharpening your axe like in this little story. You have to rethink your lifeline, find your weak points and revise and strengthen them. But we also need to know our strengths and be able to apply them in a targeted and effective way. To improve means to make use of the world. As long as we continue to develop, we remain active and this means that we do not stand on the spot but live! In a small town, there were two bakers. One, who was less successful, went to the oldest one of the town one day and said that he wanted to close his bakery in that town and move to another town to open a bakery there. The oldest wanted to know why? The baker replied that his rival was more successful and that almost everyone would only buy from him. The oldest asked how he knew that. The unsuccessful baker replied that whenever he watched the successful baker's shop, he saw people walking in and coming out with their hands full. The oldest answers that the problem of the unsuccessful baker was exactly that and went on: "If you had wasted all your time on watching and hating your competitor instead of using your energy in your own work and bakery, then maybe you would be successful today too." 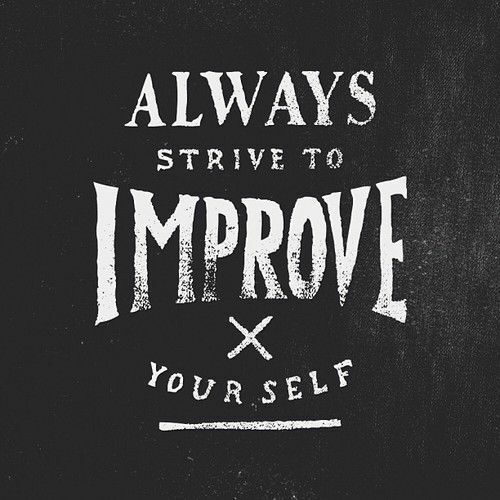 To improve, you need to know your own strengths and use them consciously without distractions. This takes time but pays off in the end. This is not immediately linked, but if you continue to work on yourself and the things you love, then it gets better and better with time. This requires personal development. You should set yourself goals that are realistic and strive for them. The realization of the goals will take place step by step with time, if you continuously work on your goals. Patient and steady steps like a turtle will eventually lead you to success. Do your best to achieve the ultimate success and trust in it and most importantly: Trust yourself! Be open and think and read versatile to absorb new information and think about whether it is applicable to you! You should also always have a plan B if something doesn't work. Having experienced a defeat once should not demotivate you, quite the contrary, it should even motivate you to become better! Even if a mistake sometimes throws you a few steps back, you can still see it as a kind of start that can make your next step faster and firmer. Making mistakes is quite normal, because this is the only way to learn to make things better! That's part of the development! Don't forget: No kingdom was won overnight! I think making peace with yourself isn’t something that you do just once, but rather a perpetual process where you make one concession at a time. personally, I think that responsibilities and concession to yourself are very important, because that can lead to you being able to show insight.